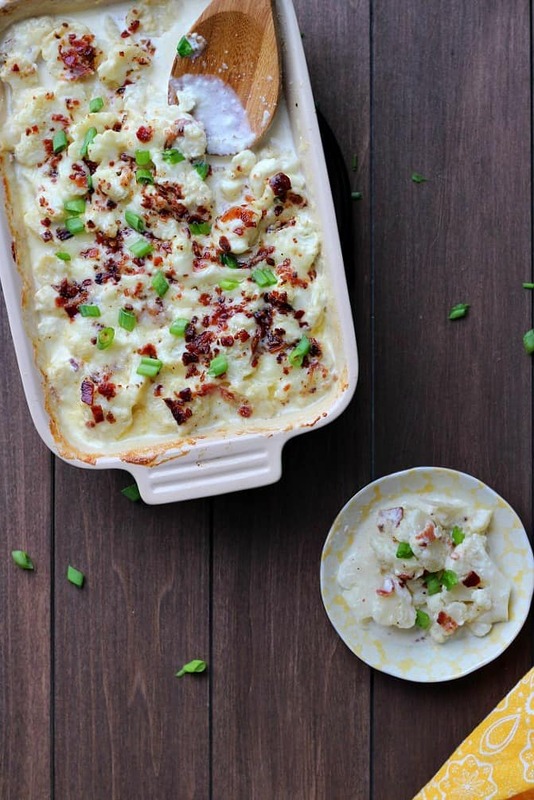 Low carb Au Gratin Cauliflower is just as creamy and flavorful as Au Gratin Potatoes! 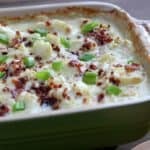 While this recipe for Bacon Cheddar Au Gratin Cauliflower is perfect for those following low carb, keto, and gluten free diets, everyone will love it! With the exception of the cauliflower, the recipe is almost identical to my Bacon Cheddar Au Gratin Potatoes recipe (coming soon!). I have a trick that I use to give this dish the same consistency as the classic original. Simply slice the cauliflower the same way you would slice potatoes rather than using the whole florets. This allows all of the ingredients to layer on top of each other easier instead of sliding off. I usually make this recipe as a side dish, especially in the summer. It makes a great pot luck dish too! If you are not using leftover bacon, you will want to cook and crumble that first. 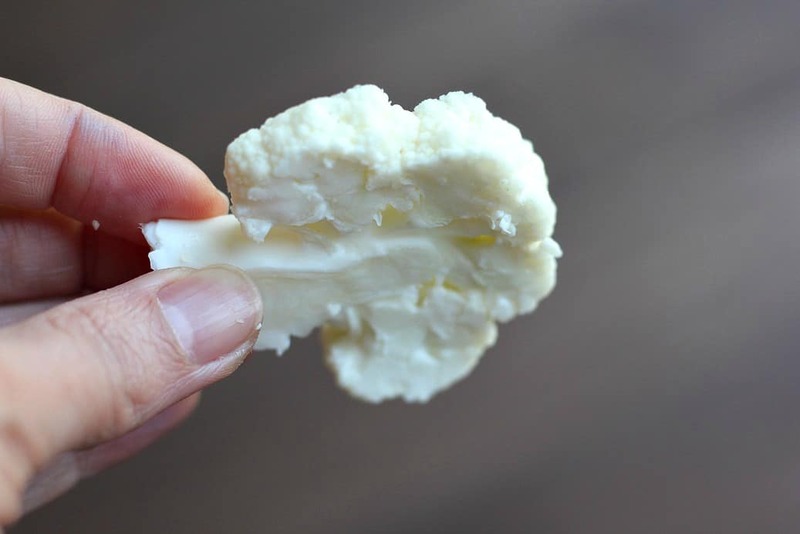 Slice the cauliflower florets into thin pieces (as shown in the photo below) so they resemble potato slices! Shred the cheddar cheese, if necessary. Preheat your oven to 350 degrees F. Whisk together the heavy cream, milk, garlic, salt, and pepper. Set aside. 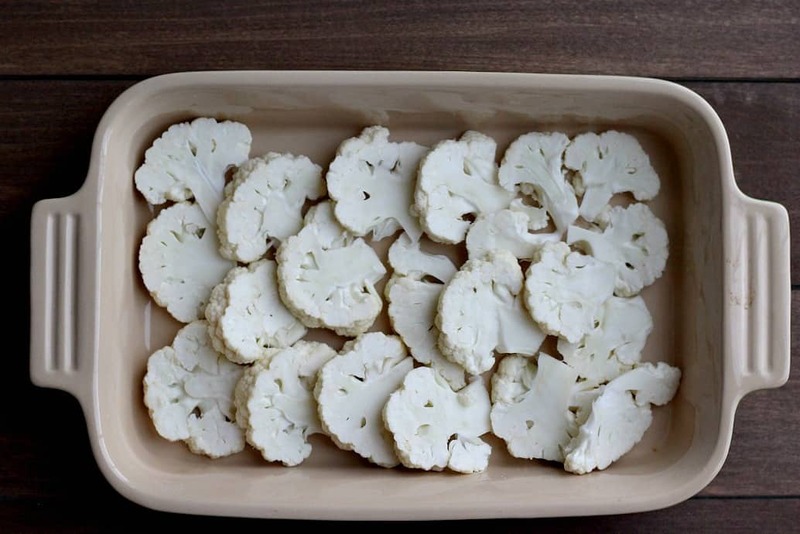 Place a layer of the sliced cauliflower florets into the bottom of a medium size baking dish. I am using this dish, but in green. Top with 1/3rd of the cheddar cheese and bacon. 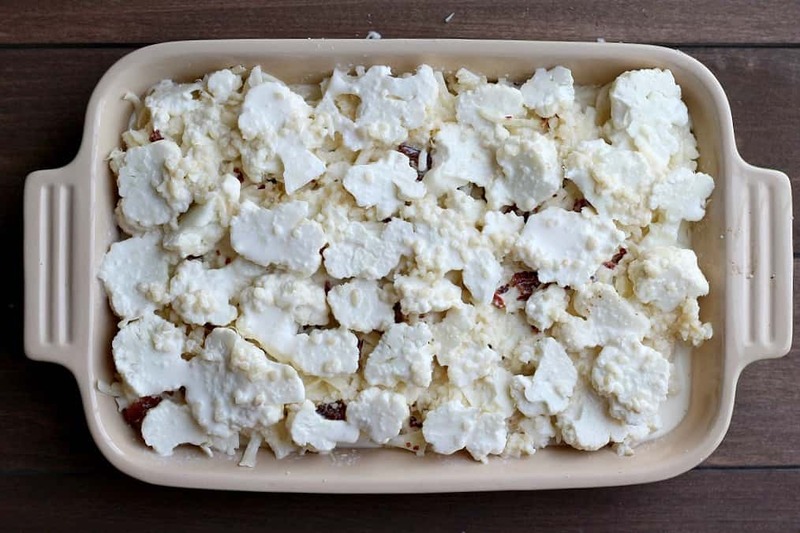 If you are using a larger baking dish, you may only have 2 layers, so divide your cheese and bacon in half. Cover the cheese and bacon with another row of cauliflower, then more cheese and bacon. Add one last layer of cauliflower. Set the remaining bacon and cheese aside. Pour all of the cream mixture evenly over the top of the cauliflower and cover tightly with foil. Bake for 45 minutes, or until fork tender. Once the cauliflower is tender, remove the foil and add the remaining cheddar cheese and bacon to the top. Return to the oven for 5-10 minutes, until melted. I love the way this recipe looks right out of the oven. The baked on cheese gives it a rustic look. Simply add some chopped green onions to the top and serve! I do want to note that as written this recipe will result in a thin sauce. I don’t like any of the low carb thickeners. If you are not following a low carb diet you can add 1-2 Tablespoons of gluten free or regular flour to thicken the sauce more. 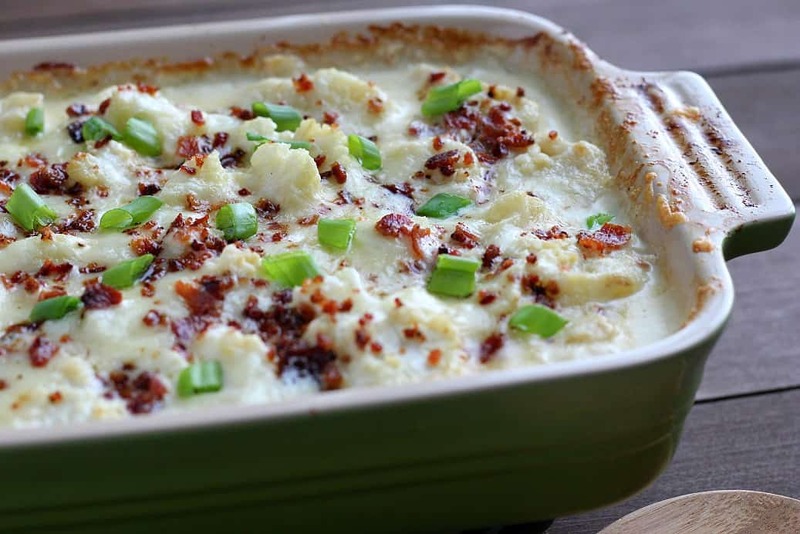 Lower in carbs and gluten free, this recipe for Cheddar Bacon Au Gratin Cauliflower is just as creamy and flavorful as Au Gratin Potatoes! 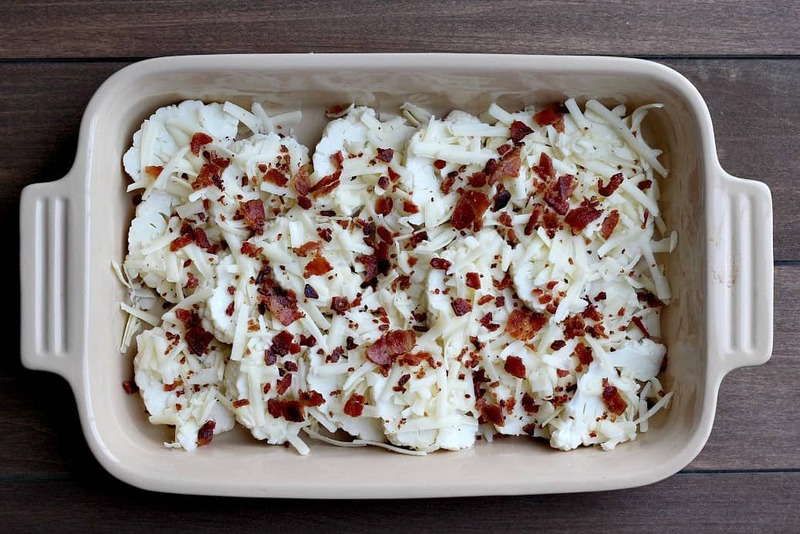 Place a layer of the sliced cauliflower florets into the bottom of a medium size baking dish and top with 1/3rd of the cheddar cheese and bacon. * If you are using a larger baking dish, you may only have 2 layers, so divide your cheese and bacon in half. Pour all of the cream mixture evenly over the top of the cauliflower and cover tightly with foil. Bake for 45 minutes, or until fork tender. Once the cauliflower is tender, remove the foil and add the remaining cheddar cheese and bacon to the top. Return to the oven for 5-10 minutes, until melted. the recipe as written will result in a runnier "sauce" that thickens slightly when cooled. If you are not following a keto or low carb diet, you can add 1-2 T of flour to help thicken it.